There are hundreds of different species of primates, monkeys, orangutans, Gorillas, chimpanzees, gibbons and apes. Primates are the most intelligent animals on the world apart from humans. We evolved from primates. live in two different continents. Apes live in Africa but monkeys live in South America. The capuchin is the smallest of the apes. They both live in the rainforest and feed on the fruit, and leaves. They spend most of their time swinging through tree branches. Monkeys either have long, strong ars to help them swing, or they swing by their tails. are endangered species. They are protected and illegal to hunt yet still only 17 years and the species will be extinct. This is due to the cutting down of their habit. are the largest of all primates. They can weigh as much as 275kg. They live in forest areas. They spend most of their time looking for food. Which consists of fruit and other berries. If gorrillas live near crop fields and farms they are likely to eat those crops. Gorillas are now endangered animals because farmers are killing those found on their land. are amongst the smallest primates. They weigh roughly 6kg. 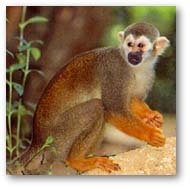 They are found in forest areas and are much more in the trees than on the ground. They are not born in litters. A female has about one very 2-3 years. have the most resemblance to humans. They commoly live north of the Congo River. Chimps walk on all fours and spend more time on the ground than other primates. They eat fruit, and sometimes even small animals. Even monkeys. They make and use tools to break open food like nuts.